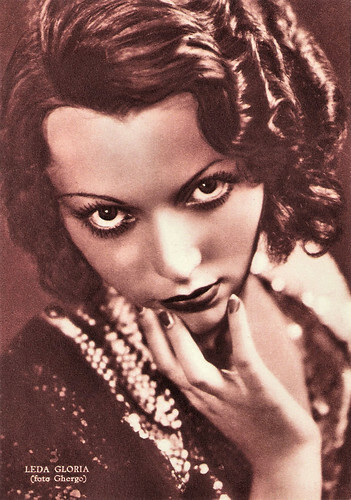 Italian film star Leda Gloria (1912-1997) had a prolific career during the 1930s and 1940s. She was one of the favourite film actresses of the young Federico Fellini, but is also remembered as the wife of mayor Peppone in the Don Camillo films of the 1950s and 1960s. 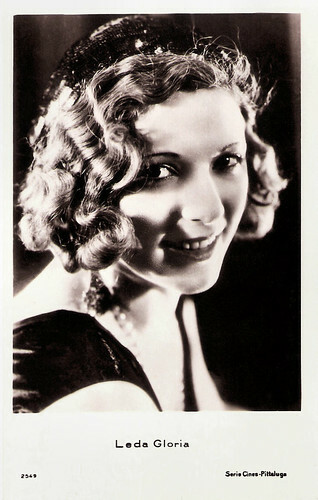 She appeared in 66 films between 1929 and 1965. Italian postcard by Rizzoli, 1937. Photo: Ghergo. Italian postcard by Rizzoli, Milano, 1940. Photo: Ghergo. Italian postcard by Rizzoli, Milano, 1942. Photo: Ghergo. Leda Gloria, pseudonym of Leda Nicoletti was born in Rome, Italy, in 1912. She started her film career already at a young age, winning a film contest held by an American film company in Italy. 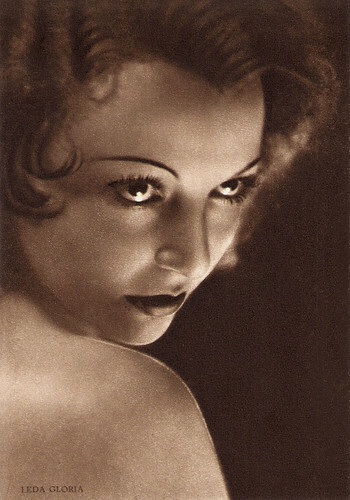 She dropped her studies as harpist and acted in various silent Italian and German films. Gloria’s first film seems to have been the comedy Ragazze non scherzate/Girls do not joke (Alfred Lind, 1929) with Maurizio D’Ancora. 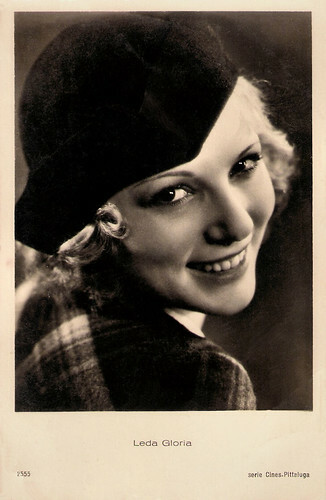 Another of her early film roles was next to Lil Dagover in the German sound film Es gibt eine Frau die dich niemals vergisst/There is a woman who never forgets you (Leo Mittler 1930), also with Iván Petrovich. With the coming of sound cinema she became one of the most active and popular Italian actresses. She first made her mark with two films by Alessandro Blasetti, Terra madre/Mother Earth (1931) and Palio (1932), playing lively and spontaneous country girls. In Terra madre Gloria played country girl Emilia opposite Sandro Salvini, former love interest in the silent diva films. Here he plays a duke who wants to sell his estate and move to the city, but after a fire extinguished with the help of the farmers he decides to stay. In Palio, jockeys represent various neighbourhoods (contradas) in the Italian city of Siena. The jockeys fight each other and love makes blind. Jockey Zarre (Guido Celano) breaks up his affair with the young Fiora (Gloria) when she is courted by a captain from a rival contrada. When a singer (Laura Nucci) in whom he is infatuated, sets up a trap together with his rival in love and horse-riding, Zarre almost fails. Finally he manages to win the Palio, and gains Fiora back as a bonus. Contrasting the bleak and bloodless 19th century vamps, Gloria showed a healthy beauty and simple but often convincing and solid acting. Examples of this she showed in La tavola dei poveri/The table of the poor (Alessandro Blasetti, 1932) and Il cappello a tre punte/Three Cornered Hat (Mario Camerini, 1934) with Eduardo De Filippo and Peppino De Filippo. 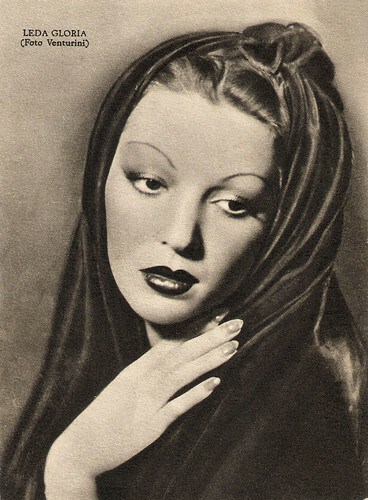 Leda Gloria encountered a big success with her first dramatic character in Montevergine (Carlo Campogalliani, 1939), starring Amedeo Nazzari in a story about a man bound for revenge as he has been wrongly accused of murder and innocently imprisoned. 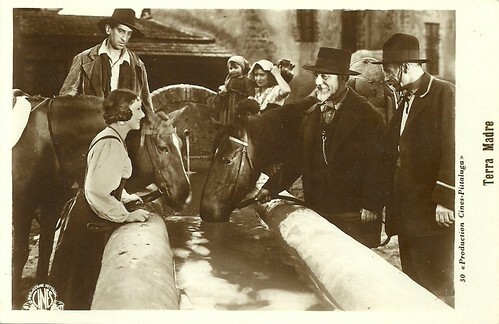 Italian postcard by Produzione Cines-Pittaluga, no. 30. Photo: Leda Gloria had in the rural drama Terra madre (Alessandro Blasetti, 1931). Italian postcard by Rizzoli, 1938. Photo: Manenti Film. Italian postcard by Rizzoli, Milano, 1941. Sent by mail in 1943. Photo: Venturini. Among Leda Gloria’s films from the war years are Antonio Meucci (Enrico Guazzoni, 1940) starring Luigi Pavese as the telephone inventor and Gloria as his wife Ester, Anime in tumulto/Souls in turmoil (Giulio Del Torre, 1942) on a surgeon’s wife who steals a baby when she cannot have one, and Dagli Appennini alle Ande/From the Apennines to the Andes (Flavio Cavalzara, 1943) on a boy (Cesare Barbetti) crossing the ocean and the whole of Argentine in search of his mother (Gloria). After the war she was involved in variety at the Company of Giulio Donadio. She returned to the cinema with a serious, supporting part in the Neorealist film Il mulino del Po/The Mill on the Po (Carlo Lizzani, 1949), starring Carla Del Poggio and Jacques Sernas and situated in the late 19th century countryside near Ferrara. Future film director Federico Fellini was one of the scriptwriters for this film. He later recalled that she had been one of his favourite actresses. 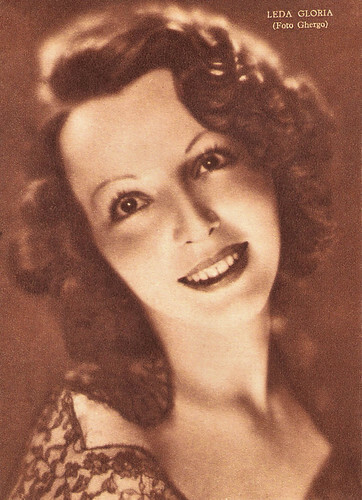 Subsequently Leda Gloria worked as a supporting actress, often in parts as mothers of the leading characters, but her performances were always moderated and well-delivered. She played Cosetta Greco’s’s mother in Le ragazze di Piazza di Spagna/Girls of the Spanish Steps (Luciano Emmer, 1952) and Raf Mattioli’s mother in the successful comedy Guendalina (Alberto Lattuada, 1957). Leda Gloria also played Eduardo De Filippo’s wife in the comedy Napoli milionaria/Side Street Story (Eduardo De Filippo, 1950). It tells the story of ordinary people living on a Naples sidestreet, from 1940 to 1950 under the dominance of the Fascists, the Nazis and then the Allies occupation forces. Gloria is well remembered as Signora Botazzi, Peppone's wife, in the Don Camillo comedies with Gino Cervi’s as the communist mayor Peppone and Fernandel as his opponent Don Camillo. The series included Don Camillo/The Little World of Don Camillo (Julien Duvivier, 1952), Il ritorno di Don Camillo/The Return of Don Camillo (Julien Duvivier, 1953), Don Camillo e l’onorevole Peppone/Don Camillo's Last Round (Carmine Gallone, 1955), Don Camillo monsignore… ma non troppo/Don Camillo: Monsignor (Carmine Gallone, 1961) and Il compagno Don Camillo/Don Camillo in Moscow (Luigi Comencini, 1965), Leda Gloria's last film. 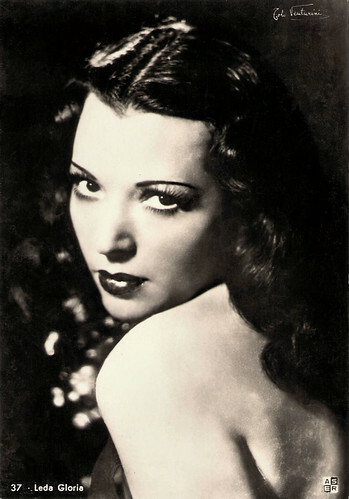 After a long illness, Leda Gloria died in Rome, Italy, in 1997. She was 84. Gloria had two twin daughters: Atte Ughetti and Ilia Ughetti. Both appeared with their mother in Redenzione/Redemption (Marcello Albani, 1943). It was their first and only screen appearance. Italian postcard by Aser, no. 37. Photo: Venturini. Italian postcard by Casa Editr. Ballerini & Fratini, Firenze, no. 25555. Photo: serie Cines / Pittaluga. Italian postcard by Casa Editr. Ballerini & Fratini, Firenze, no. 25549. Photo: serie Cines / Pittaluga. Sources: Adnkronos (Italian), Wikipedia (English and Italian) and IMDb.